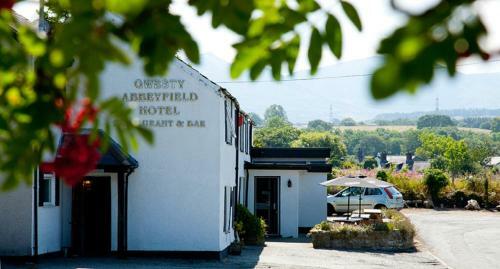 The Abbeyfield is a cosy pub with rooms option just down the orad from Penrhyn Castle on the fringes of Bangor. Oak beam ceilings and a tasty restaurant complete the picture. The A55 location makes this an ideal base for exploring caost of North Wales and Snowdonia. Bangor Services Station is just five minutes drive and the A55 will also take you swiftly to Llandudno. There's no shortage of outdoor activities in the nearby area with everything from mountain biking to sailing and kayacking, organised by Plas Menai, the National Outdoor Centre for Wales. There is a public bar and a small, cosy restaurant serving very good British food, using local Welsh produce where possible. Over the years this old coaching inn has served as a post office and a school. The 11 bedrooms and one family room each feature en-suite facilities (showers), telephone, clock-radio, tea making faciities and a colour T.V. FREE wireless internet access is also available. Checkout the nearby Zip Line which is just 10 minutes from the Abbeyfield Hotel, the longest zip wire ride in Northern Europe.